December of 1941 when WWII for the United States began, I was four-years-old, and when it ended, August, 1945, I had just passed my ninth birthday. 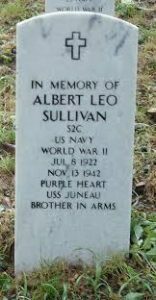 I have both good and bad memories of those years, and one I will never forget is the story of the Sullivan brothers who died together on their ship. We had no instant news feed or pictures as events unfolded, but we did have newsreels at the movie theaters which brought us vivid images of what happened in the Pacific and in Europe. 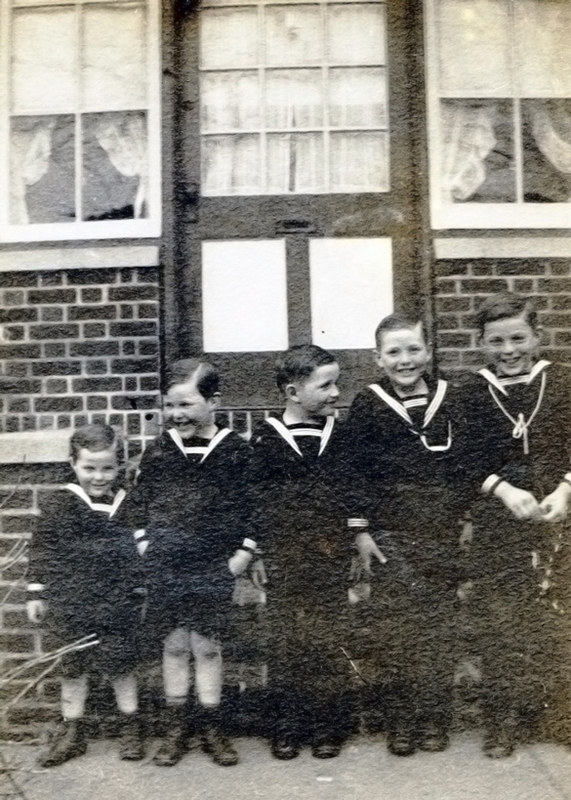 Growing up, the boys were often referred to as “The Fighting Sullivans”, an apt name for five spirited boys. They also had a sister, Genevive, and Al married and had a son. 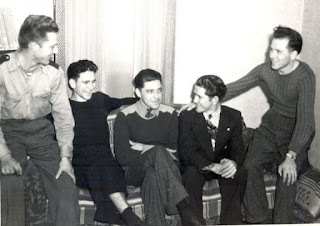 The five brothers, George Thomas, age 27; Frank Henry, age 25; Joseph Eugene, age 23; Madison Abel, age 22; and Albert Leo, age 19 were together on that Sunday when news of Pearl Harbor came over the radio. They enjoyed Sunday dinner with their family in Waterloo, Iowa, December 7, 1941. They heard the report of Pearl Harbor and immediately thought of their friend Bill Ball stationed there. He was the boyfriend of the boys’ sister, Genevive. After learning of his death, the brothers wanted to take up the fight in his memory. 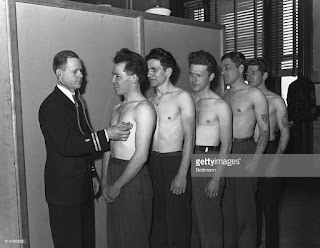 They enlisted on January 3, 1942. George and Frank had served in the navy before, but the others had not. Here they line up for their physicals. 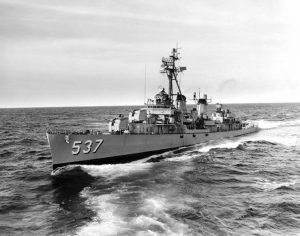 The Navy did have a policy concerning siblings serving together, but it was not strictly enforced. The Navy balked at their first request, but in the end relented and assigned them to the same ship. That ship was the U.S.S Juneau which would serve in the Pacific Ocean. The ship fought a number of battles during the Battle of Guadalcanal. In November of 1942, a torpedo struck the ship, and it withdrew from the battle. As they were leaving the Solomon Islands area, another torpedo from a Japanese submarine caused the ship to sink. No rescue efforts were made at the time in fear of the Japanese naval presence. After eight to ten days, survivors were found. Reports said that Frank, Joe, and Matt died instantly in the hit. Two made it into life rafts, but didn’t make survive for rescue. Al drowned the next day. George survived for four to five days, but died before the rescue came about. Their parents didn’t learn of the deaths officially until January 11, 1943 when three men in naval uniforms came to the home and gave them the news. Imagine the horror of learning that all five of your sons died. Ironically, in his letter to the Navy, George had said, “If we go down, we’ll all go together.” Tragically, they did. Their deaths lifted them from five enlisted men to national heroes. Their legacy led to changes in policy for the Navy. 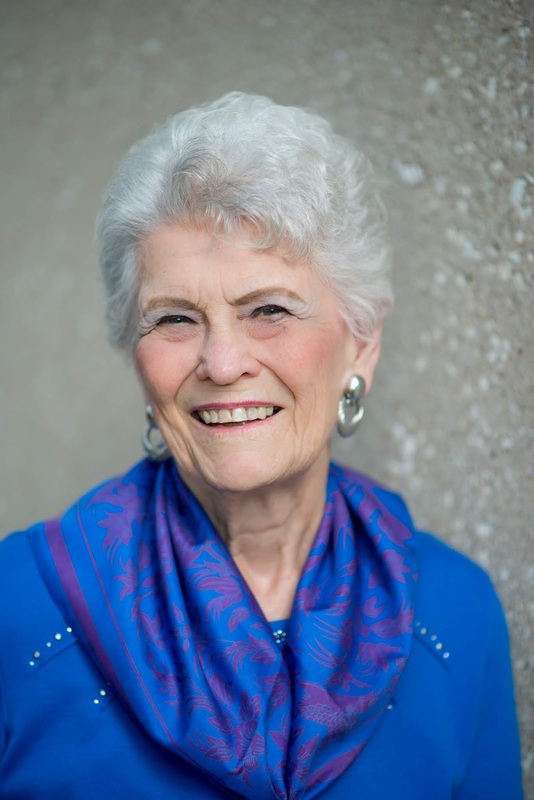 The Sole Survivor Policy of 1948 provide for immediate discharge of serving military personnel when there was only one surviving sibling in the family. With the new policy in effect, no other family will have to suffer the heartbreak Aleta and Thomas Sullivan faced with the deaths of their sons. Their parents, Aleta and Thomas, became involved with War Bond Tours and spoke all over the country promoting the war effort. Aleta also worked with other at the USO Hollywood Canteen in 1944. Hollywood made a movie about the family in 1994, and it appeared in movie theaters to packed houses during the last year of the war. The movie, Saving Private Ryan, is also said to have been inspired in part by the story of the brothers. With the new policy in effect, no other family will have to suffer the heartbreak Aleta and Thomas Sullivan faced with the deaths of their sons. All five boys have headstones even though their bodies were not recovered. Recent surveys and searches have uncovered the ship. A team funded by Microsoft co-founder Paul Allen recently discovered the wreckage of the USS Juneau 2.6 miles below the surface of the Pacific Ocean, near the Solomon Islands. For years, Allen’s team has been combing the Pacific for ships that sank decades ago. The team has used advanced technology such as side-scan sonar and submersible drones to locate several ships, including the Juneau. Finding the final resting place of the USS Juneau connected their endeavor with a part of U.S. history that still reverberates today in both memory and policy. I may have been only eight years old when the movie came out, but I saw it with my parents and sister, and I will never forget it. My mother cried, and I cried as did most of the audience on that day. WWII lasted only about three and half years, but it brought this nation together to sacrifice whatever it took to maintain our freedoms and protect our shores. 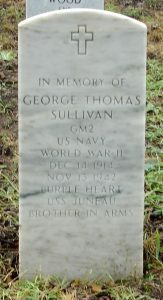 Thanks to the website: https://ww2gravestone.com/five-sullivan-brothers-died-together/ for the information and the pictures. Do you have any special memories or stories you've heard about WWII? Share them with me for a chance to win a paperback or digital copy of my novella, Thanksgiving in the Valley, just in time for the Thanksgiving holiday. Be sure to include your email address for a chance to be in the drawing for the book. Travis fell in love with Violet when he was sixteen and she was fourteen. Now, ten years later, he returns to Ridgewood Valley as a lawman and still loves her. Violet has always loved Travis and when he returns from serving in the U.S. Cavalry, her love grows. Because she’s a preacher’s daughter, and he has less than stellar reputation while in the cavalry, he doesn’t feel worthy of Violet’s love and tries to avoid her. A few days before Thanksgiving, while he is away on a man hunt, Violet is shot during an attempted robbery of the church’s offerings. When Travis returns to town learns of Violet’s injuries, he realizes he can’t live without her. Will this Thanksgiving Day be one of great blessings for these two hearts? I have never heard of these brothers before. It's interesting to know why the Sole Survivor Rule got started. Thank you for this post. It was a tragic story back during the war. It's one story I hope is never buried and forgotten. I do need your email address to enter you in the contest for the book. Thanks for stopping by. I have heard of the Sullivan Brothers and have watched themivie. My father served in China, India And Burma theater.he drove a supply truck and was a cook. He told of a tim3 when Pat O’Brien was there with a USO troupe and some famous Hollywood actresses. They were so excited about seeing them that one of the mess tents burned down. We have a whole scrapbook full of his letters home to his family. They even saved the envelopes. There was not much war news in them because he couldn’t tell too much about the actual war. He wrote a poem about being there called China Convoys. I have it in a double frome with his picture on the other side. 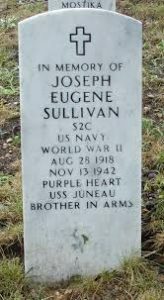 We need to remember there brave men such as the Fighting Sullivan brothers. Thanks for the post. I remember that all we knew was what we saw in newsreels. News from the soldiers was limited and my great-aunt worried all the time about her sons. Amazing how we see everything minutes after it happens these days. What a treasure to have his poem preserved in such a way. Thanks for stopping by. We are thankful for your father's service. I heard about the Sullivans as a child in the early 50's. My father was aboard a convoy that left Angel Island,San Francisco in early Dec 1941. Their convoy had left Pearl Harbor just before the bombing by the Japanese..
My father was a radio operator in the Army Air Corp and landed first in Queensland,Australia. The remainder of the convoy was captured by the Japanese at Have and the surviving soldiers became prisoners of war,the lost battalion that built the Burma road and the bridge over the River Kwai. Most from the List Batallion were from my area of Texas with a great number known to our family. We are thankful for your father's service. I would imagine prayers kept many young men alive. So glad your father survived. I remember the movie about the Lost Battalion and the building of the bridge. What a daring feat that was. I do need your email address for your entry into the drawing. What a sad story! My dad would have only been two years old at the time and later was not accepted for medical reasons. Perhaps because of this, I don't remember hearing my family talk about stories from the war. My father wanted to serve, but was listed as 4-F because of a birth defect in his knee. 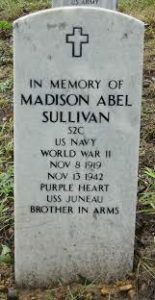 The story of the Sullivan brothers still saddens me today as the mother of three sons. Thanks for stopping by and sharing. Thank you for sharing this historical moment in our nation. I wasn't living during WWII but have heard a few stories of the conditions and battles family or friends endured. I salute each one and their family that have served in our military. God bless them richly. There's a family of brothers in our area that served together and only one remains today. Your book must be read. Thanksgiving in the Valley sounds wonderful and the type of stories I enjoy. Blessings for a wonderful Thanksgiving. Thank you for the giveaway opportunity to win a copy of your Thanksgiving Novella. Thank you for stopping by, Marilyn and sharing the sentiments so many of us are feeling this day. I don't recall ever hearing of the Sullivan Brothers, but I am familiar with the Sole Surviving Policy. My Uncle, Edwin O'Steen, died in WWII. He was in Italy when he was killed in 1944. My dad was only 9 when that happened. When my dad was of the age to enlist, they wouldn't allow him to, because not only had my uncle died, his dad had passed away as well. So with him being the only male in the family, they would let him enlist. I'm definitely going to check more into the Sullivan brothers. Thank you for sharing! jumpforjoy at gmail dot com. That should have said, wouldn't let him enlist. My uncle served in WWII, and when he returned home, he wouldn't answer any questions. He didn't want to talk about what he'd seen and experienced. This story of the Sullivans always saddened me. Thank you for sharing. I had never heard of the Sullivan brothers story before. My heart cannot even image how their family must have felt at such a devastating loss of all 5 of them. My father served in the Phillipines in WWII. I remember after having seen the movie, Platoon, I asked my father if the horrible boobie traps that the enemy had set in the movie really happened. My father said that they really did happen. He began to explain, and then I remember his eyes glazing over. He paused and then told me he just couldn't talk about it. The memories were too painful. I do remember my mother telling us that one of my father's best friends was blown up right in front of my dad. I am so thankful that my father survived and for his courage and perseverance to fight for our country. God bless our soldiers for our all they do to protect our freedom!!! Alison, I'm so thankful your father survived. I remember how the ones who came home were very silent about the things that happened. Today, we see them almost immediately through the news, and I can understand their silence. We are thankful for men like your father, we salute him today. Allison, you're the winner of the book. 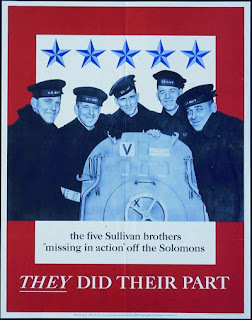 I learned of the Sullivan Brothers while doing research for a WWII novel set partly on the American homefront. Thank you for your detailed historical account of the events surrounding the loss of life of these brave men. An unthinkable tragedy for their parents to endure. My father-in-law served with the British 8th army from 1939 to 1945 in Dunkirk, North Africa, the Normandy invasion and throughout Europe. He was separated from his new bride for many years. I think of him often, especially on national days of remembrance.